In previous post, we discussed file error handler which handle the rejected file and put that to custom folder with custom file name. In this post we will discuss about next error handler which is web service handler. In web service handler rejected message is handled by web service, there is predefined WSDL interface which have to use to create web service which will handle the rejected message. Below is the schema that we need to use for that web service. Follow below steps to use web service handler for rejected file. 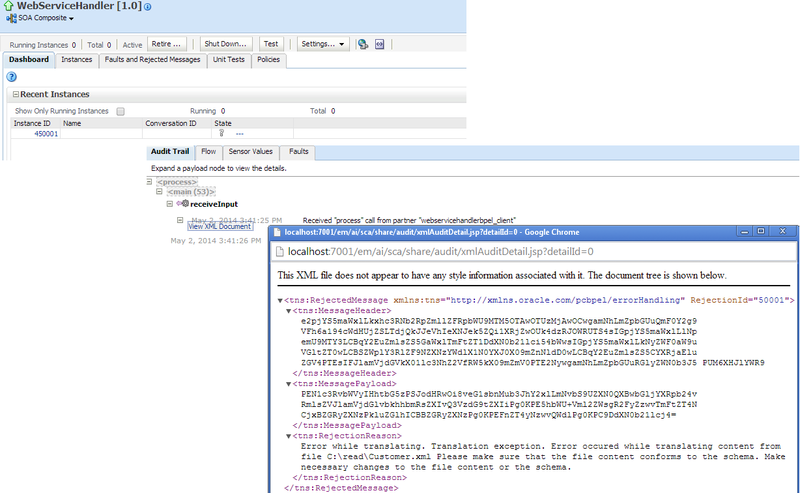 First create a web service for web service handler which will handle rejected file. Use above mentioned schema and make sure web service has only one port type and one input operation. You can add required logic to it. For this post, we will not add any logic to it. Save the composite and deploy it to the server. Below is the endpoint of web service handler. Put file corrupted file to polling location. You should see new instance of web service handler. 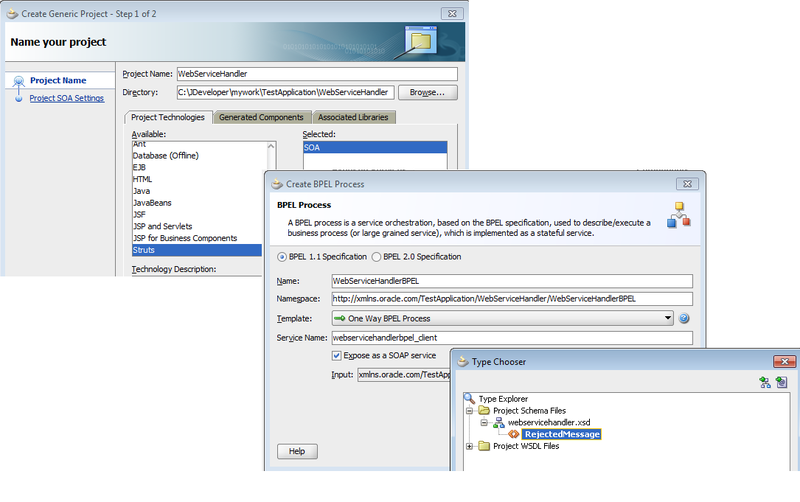 Next post explains about next error handler, File rejection Handler- JMS queue error Handler for File Adapter. One question regarding the fault policy. Is the action 'invokeWS' been removed from the version 11.1.1.7 or the format to invoke a deployed webservice changed in this version ? I am trying to call a weservice using fault-policy in my code, but the 'invokeWS' part is not working and gives 'java.lang.NullPointerException'. Do you have any idea regarding this scenario ? I haven't tested this on 11.1.1.7 version. I tested it on 11.1.1.5 version. I know there was one bug in 11.1.1.5 version for custom java handler and that was corrected in next version but not aware if they made any changes for web service handler. How can we handle invokeWS URI dynamically - If we move from Dev to QA to Prod, is any way we can control via EM Console ?